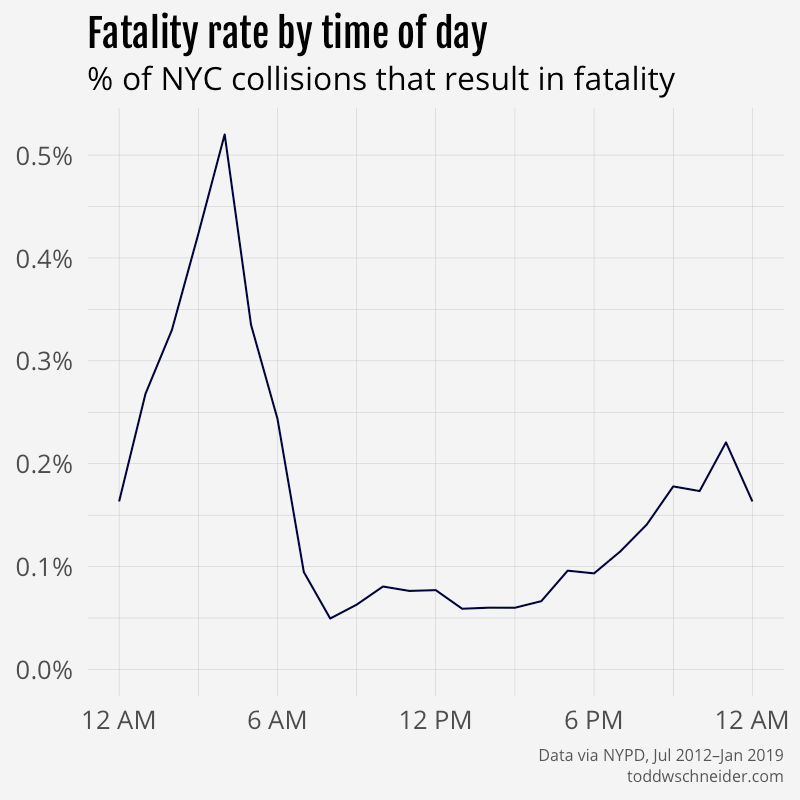 The New York Police Department provides data for every motor vehicle collision in NYC since July 2012. 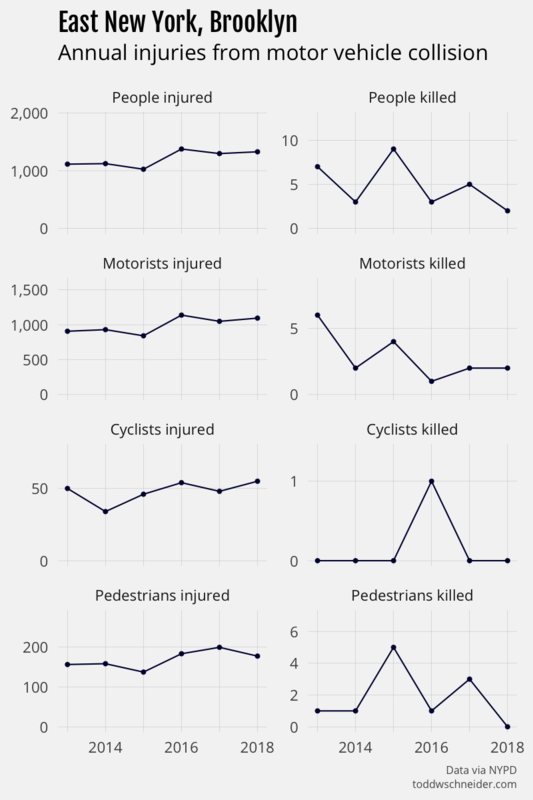 Each record includes location coordinates and other metadata, most notably the number of injuries and fatalities, segmented further by motorists, cyclists, and pedestrians. I wrote some code to process the raw data, and built an interactive heatmap of 1.4 million collisions between July 2012 and January 2019. By default the color intensity represents the number of collisions in each area, but you can customize it to reflect injuries or fatalities. Note that the raw data does not identify each collision with pinpoint accuracy, rather collisions are typically rounded to the nearest intersection, which makes some areas look artificially better or worse than they really are. For example, there are a number of collisions at both ends of the Verrazzano Bridge, but apparently none in between. In reality those collisions are likely spread more evenly across the bridge’s span, but the dataset rounds them to either the Brooklyn or Staten Island base. 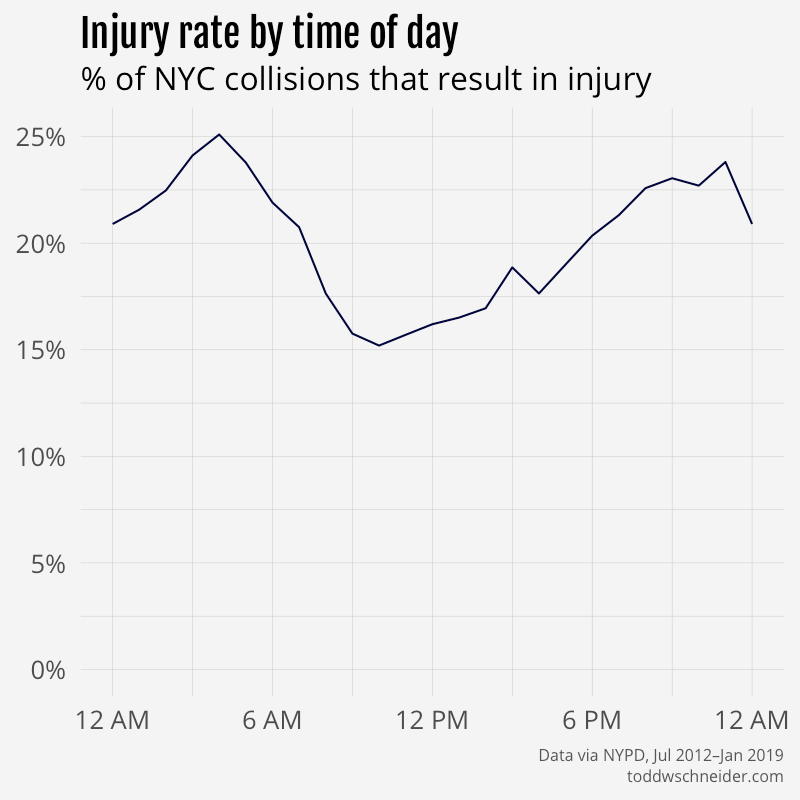 Delancey Street on Manhattan’s Lower East Side accounts for the most cyclist injuries of any area. In November 2018, the city installed a new protected bike lane from the Williamsburg Bridge to Chrystie Street, and it will be interesting to see how effective it is in reducing future cyclist injuries. If the L train shutdown—in whatever form it ends up taking—causes more people to bike across the bridge, accidents and injuries might well increase, so as noted above, it will be important to adjust for total usage. The Manhattan base of the Queensboro Bridge also accounts for a significant number of cyclist injuries, and much like at the Williamsburg Bridge, there is an attempt underway to improve cycling conditions. 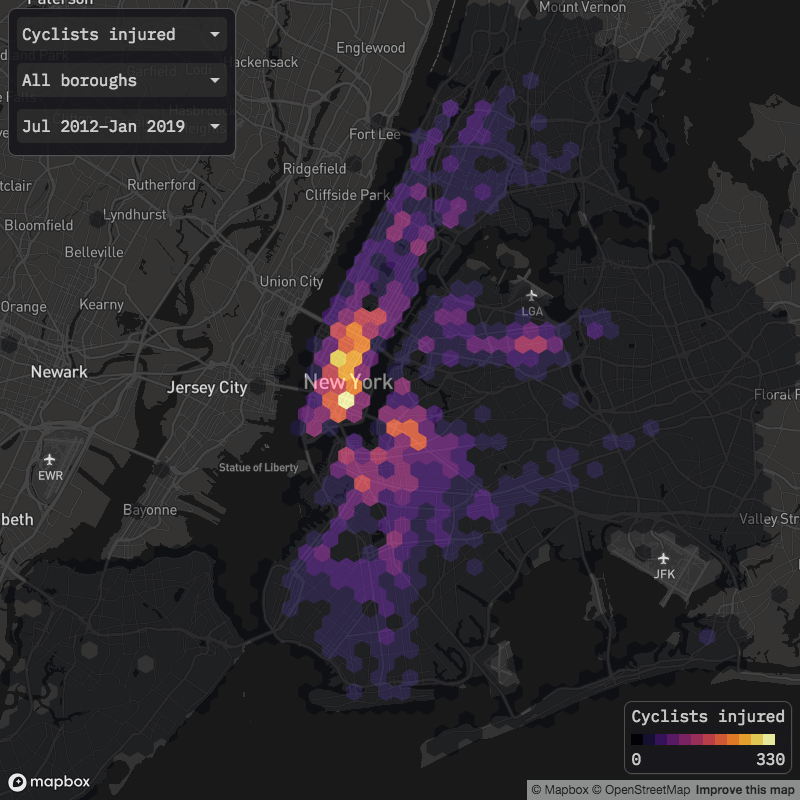 In Brooklyn, the areas with the most cyclist injuries include Grand Street between Union and Bushwick avenues in Williamsburg, and the section of Tillary Street between Adams and Jay streets downtown. 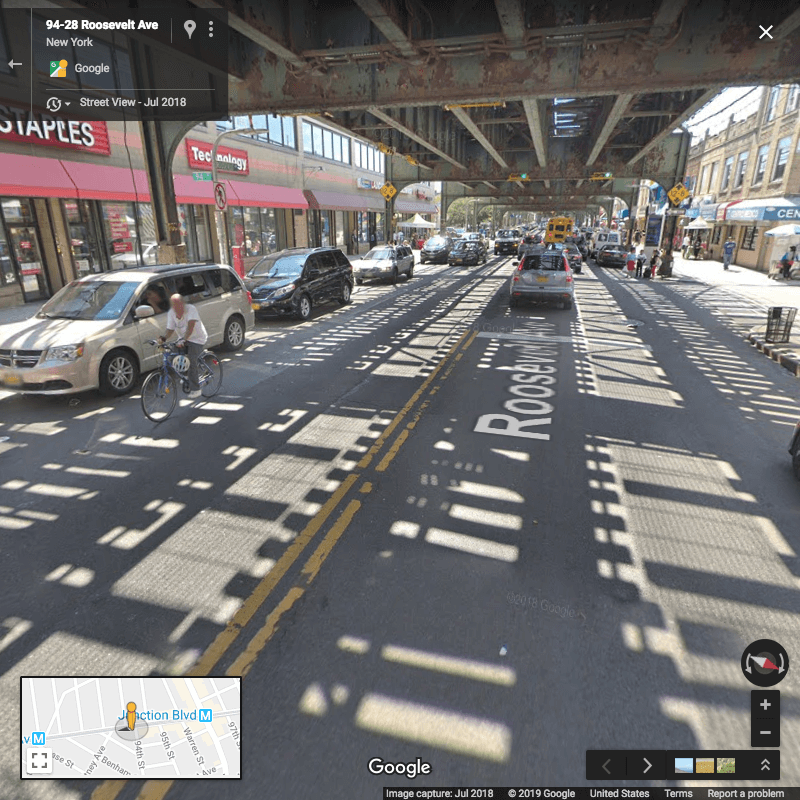 In Queens, stretches of Roosevelt Avenue in Jackson Heights appear particularly dangerous. 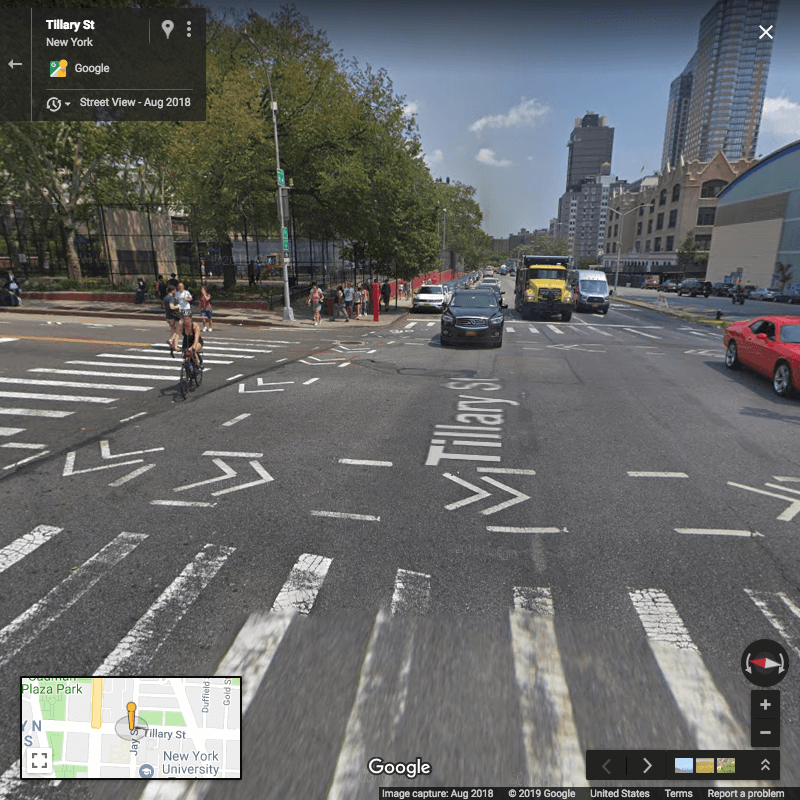 From Google Maps it appears that none of these three outer borough areas had fully protected bike lanes historically, though at least Grand Street’s bike lane was improved somewhat in the fall of 2018. 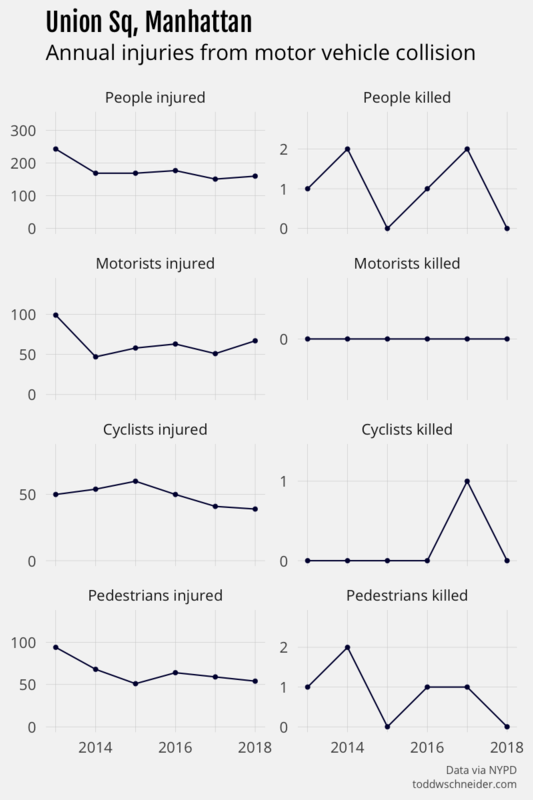 I did not do any extensive investigation of the relationship between bike lanes and cyclist injuries, but it would make for interesting further analysis. The Department of Transportation publishes a city bike map along with a shapefile, and provides lists of active and past projects dedicated to bicycle safety, all of which could potentially be used to better understand the relationship between bike lane development and cyclist safety. At a minimum, it’s good to see that some of the areas with the most cyclist injuries have already been targeted for bike lane improvements. I’d imagine that areas immediately surrounding subway stops have some of the highest rates of foot traffic, so it could be simply that more pedestrians equals more injuries. Or maybe subway stops tend to be located on busier, wider roads that are more dangerous to cross. It would be interesting to know if there are particular subway stations that have high or low pedestrian collision rates compared to their total usage, and if so, what features might distinguish them from other stations. 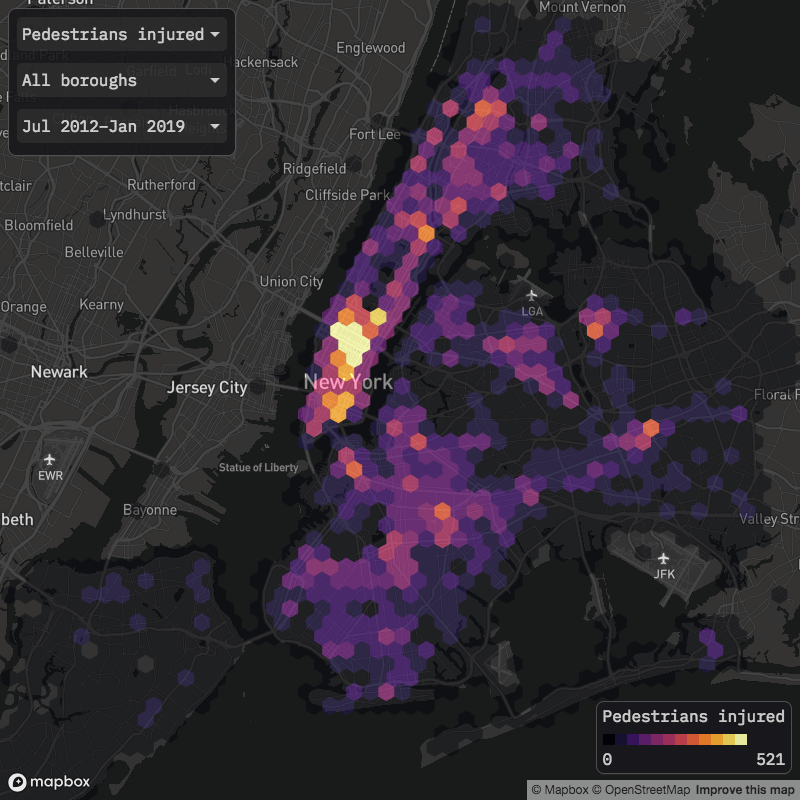 Motorist injuries are more geographically spread out than cyclist and pedestrian injuries, I would guess due to more vehicle travel at higher speeds in the outer boroughs compared to Manhattan. Highways look to account for many of the areas with the most motorist injuries: in the Bronx, sections of the Cross Bronx Expressway and Bronx River Parkway, along with the Van Wyck Expressway and Belt Parkway in Queens, and the western terminus of the Jackie Robinson Parkway in Brooklyn. 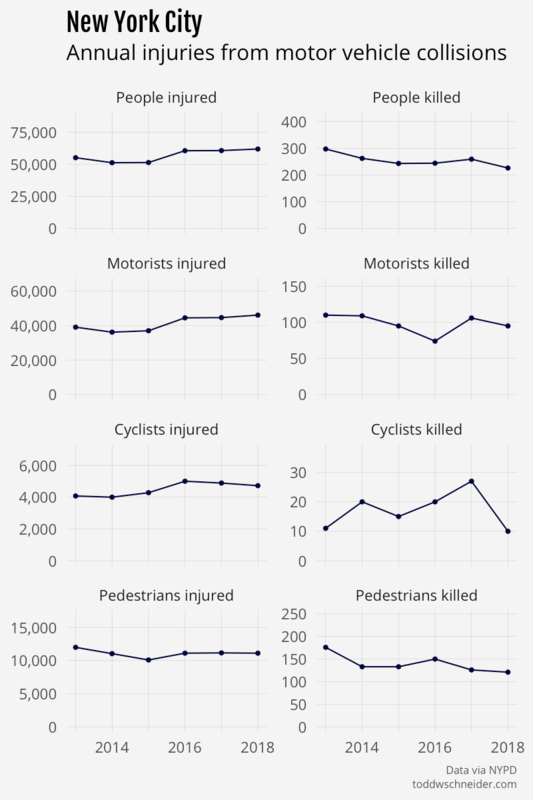 The city’s Vision Zero plan has the stated goal of eliminating all traffic deaths by the year 2024, and in general, traffic fatalities have been declining since 2012. 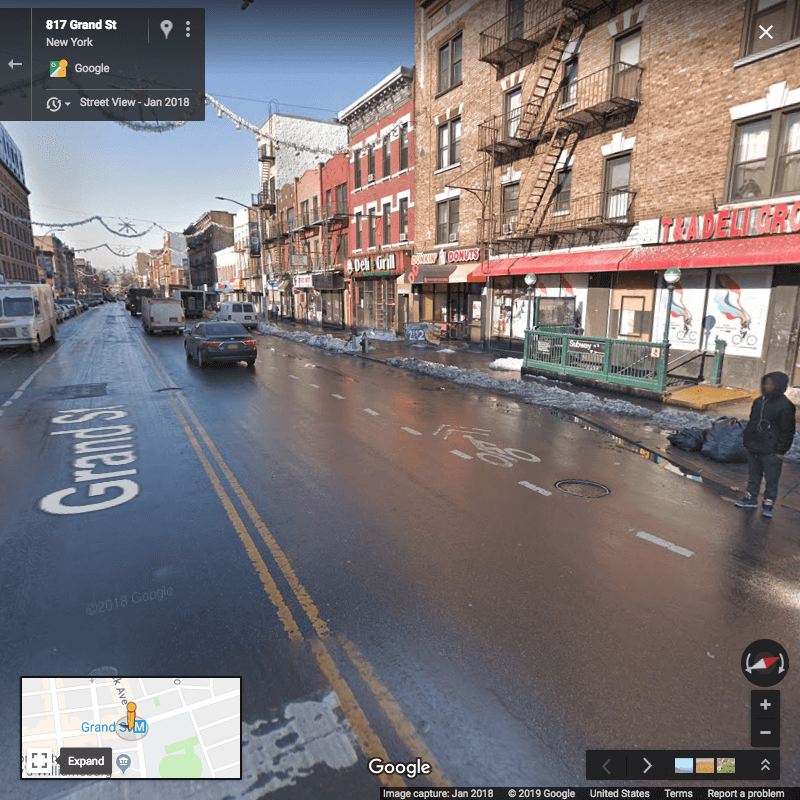 One piece of confusion: the city recently announced that there were 200 traffic deaths city-wide in 2018, but the NYPD dataset reports 226 deaths in 2018. 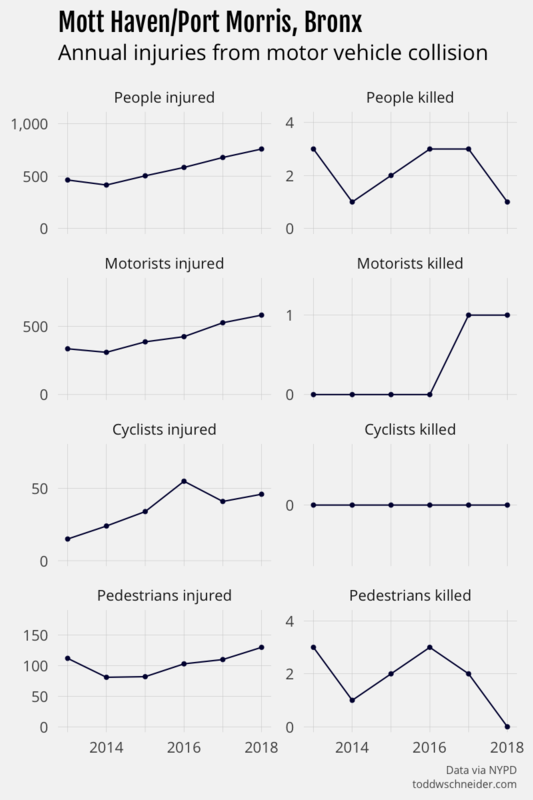 I’m not sure why those numbers are so different, but either way the trend still points toward decreasing fatalities. The number of injuries per year has increased, though, and there are individual neighborhoods that have seen improving or worsening trends. 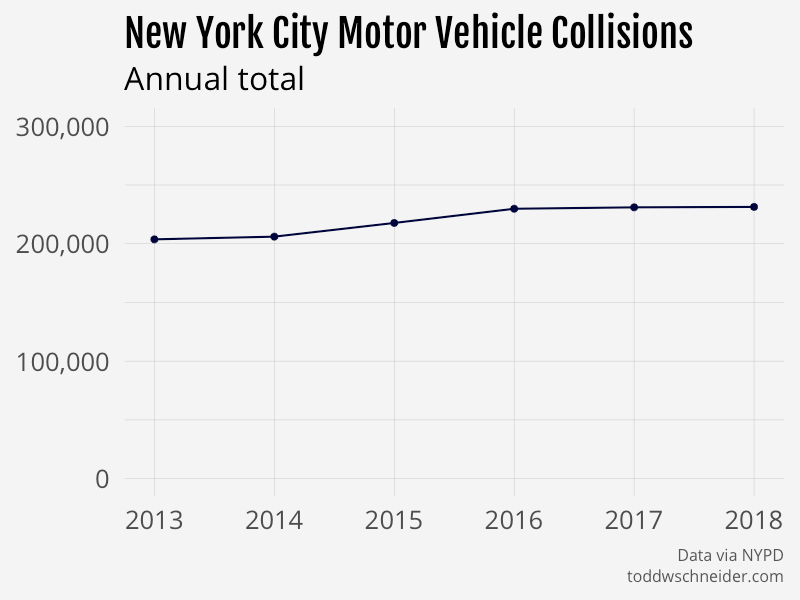 To cherry-pick a few examples: Union Square, Chinatown, and East Harlem have seen some of the bigger reductions in injuries since 2012, while University Heights, Mott Haven, and East New York have seen injuries increase. Note that the borough totals won’t necessarily add up to the city-wide total because about 5% of collisions are missing location data. 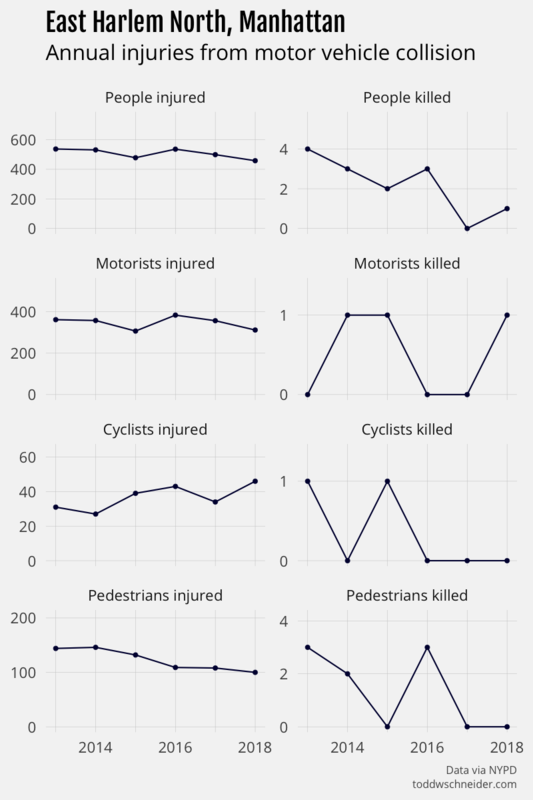 The earlier data is more likely to be missing location data, which means that the graphs by borough are probably slightly pessimistic, and in reality the earlier years have a few more collisions and injuries relative to the recent years than otherwise stated. See this spreadsheet for a table of counts by borough and year, including collisions with unknown geography. 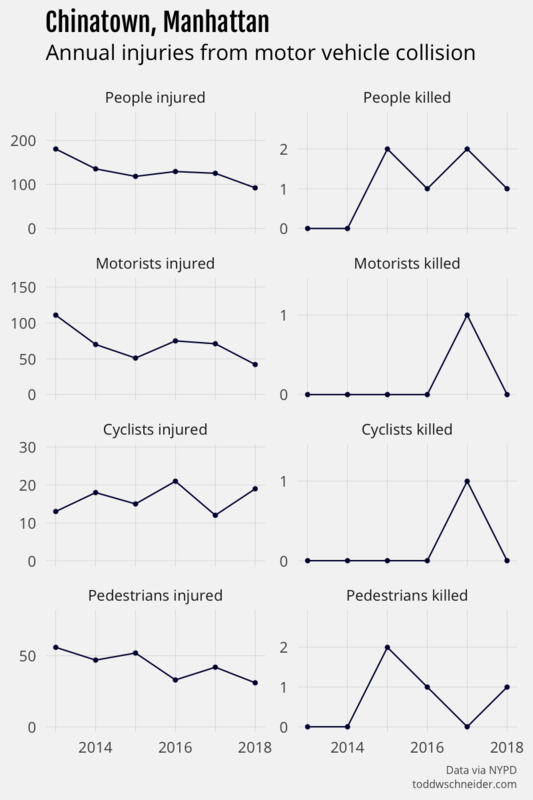 I’ve already noted a few potential topics for future work: population-adjusted collision rates and the impact of bike lanes/subway stations, but the dataset could be useful for many other analyses. 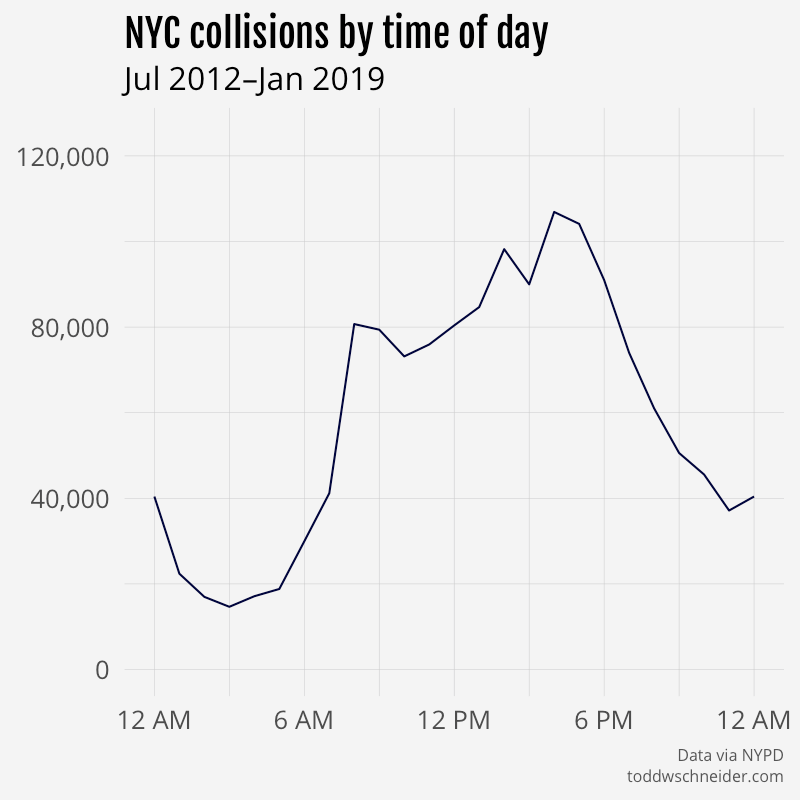 Especially in the context of my previous post about taxi and Citi Bike travel times, I wonder about the relationship between increasing road congestion, slower average vehicle speeds, and fewer traffic-related fatalities. Collisions are most common during daytime hours, when congestion is at its worst, but the likelihood of a collision resulting in an injury or fatality is highest during the late night/early morning hours. The dataset does not include detailed information about speed at the time of collision, but it seems likely that vehicles would be traveling faster at off-peak hours when there is less traffic. Darkness could also be an important factor, with differing effects on each of motorists, cyclists, and pedestrians. 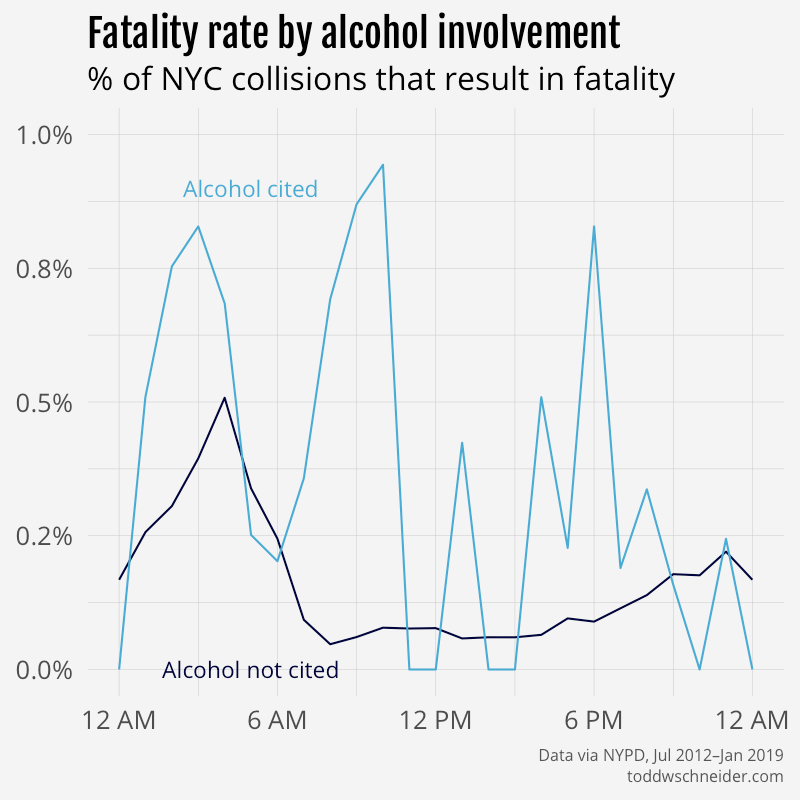 Among collisions where alcohol is cited as a contributing factor, 30% result in an injury and 0.4% result in a fatality, compared to 19% and 0.1%, respectively, for collisions where alcohol is not cited. 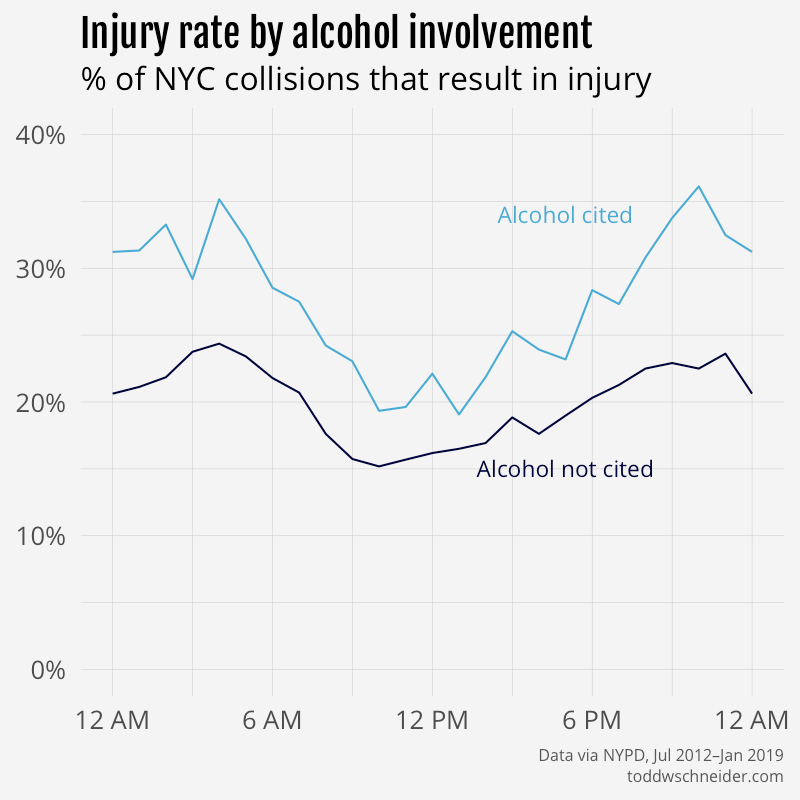 Many “correlation does not imply causation” caveats apply, including that alcohol involvement might be correlated with other factors that impact likelihood of injury, or there could be a bias in reporting alcohol as a factor given that the collision resulted in an injury or fatality. 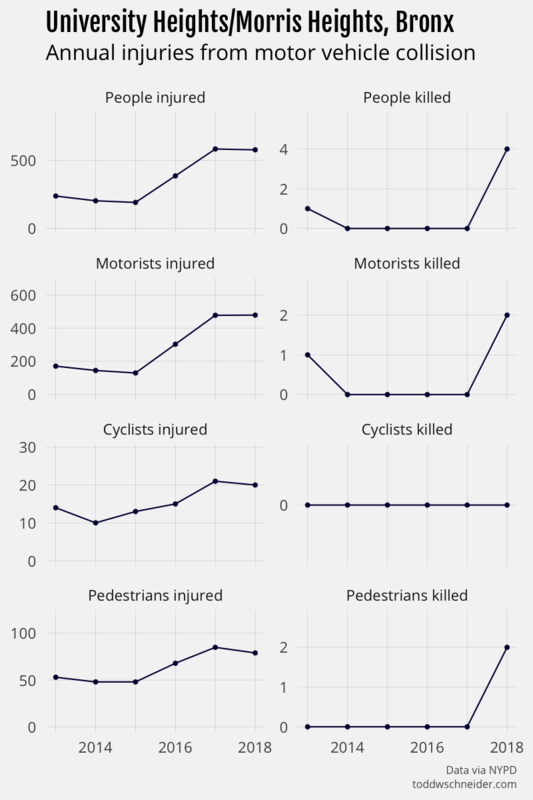 I experimented a bit with regularized logistic regressions to model probability of injury and fatality as a function of several variables, including time of day, street type (avenue, street, highway, etc. ), contributing factors, vehicle types, and more. 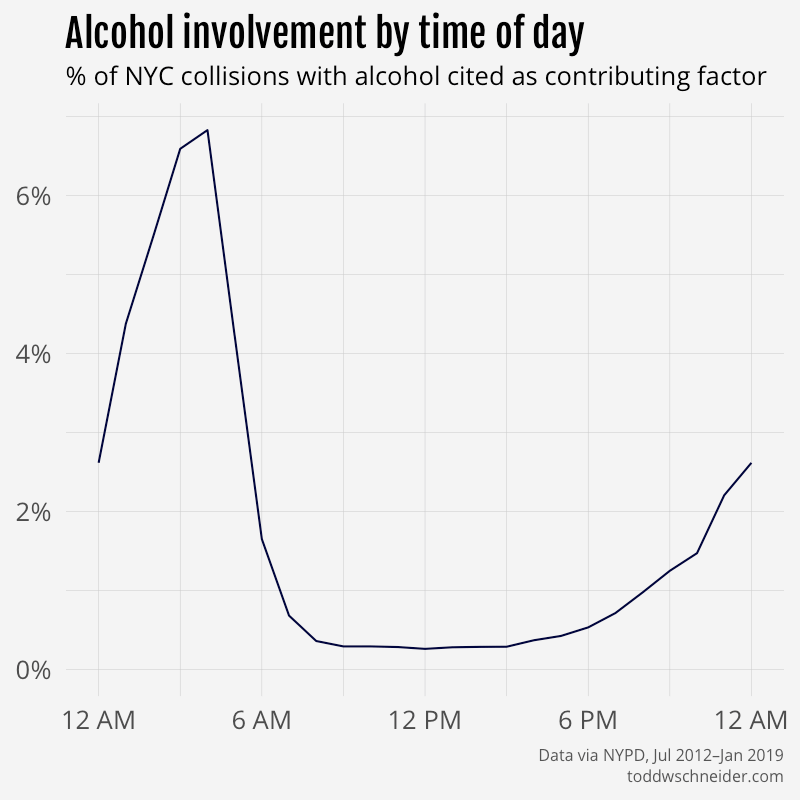 The models consistently report a positive association between alcohol involvement and likelihood of injury and fatality, though in both cases the effect is not as strong as other factors like “unsafe speed” and “traffic control disregarded”. The model reports that collisions involving bicycles are the most likely to result in injuries, while collisions involving motorcycles are the most likely to result in fatalities. It will be interesting to see what happens if new vehicle types like electric scooters gain more widespread adoption. Again the regression model cannot prove causation, but it’s still interesting to see which factors are most associated with injuries. The relevant code is available here on GitHub if you want to poke around more. Population growth, gentrification, Citi Bike’s expansion, and various other traffic control mechanisms (speed limits, crosswalks, traffic lights, etc.) all come to mind as possible areas for further study, and kudos to the City of New York for making so much of the data publicly available. The code used to collect and process the collisions data is available here on GitHub. 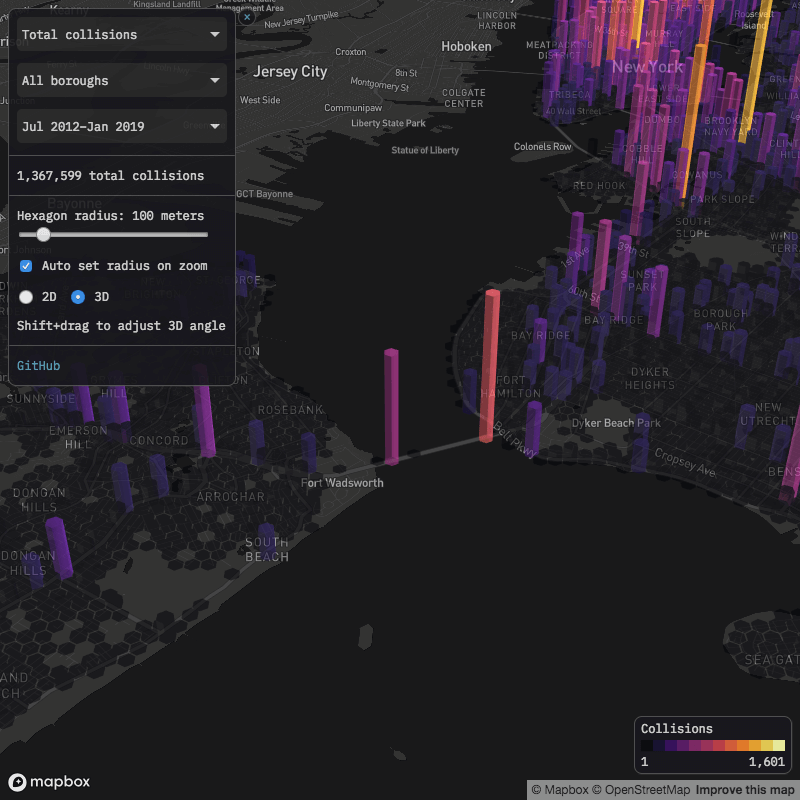 The interactive map is built with deck.gl and Mapbox. The map embedded and linked in this post uses pre-aggregated data, which helps performance, but limits the number of filters available. If you want to go a bit deeper, there is a similar version of the map available here that aggregates on the fly, and therefore allows a few extra filters: time of day, number of vehicles involved, and injury status. Note though that this “on the fly” version is much slower to load, and likely will not work on mobile devices. If you’ve been on a New York City subway platform since January 2018, you should have noticed a countdown clock that displayed an estimate of when the next train would arrive. Although there’s no official record of when trains actually stopped at each station, the countdown clock data can be used to approximate. Over the past 5 months, I’ve collected and processed some 24 million stops’ worth of this data to try to make sense of New York’s vast and troubled subway system. The code is all available on GitHub. Which NYC subway lines have the longest wait times? 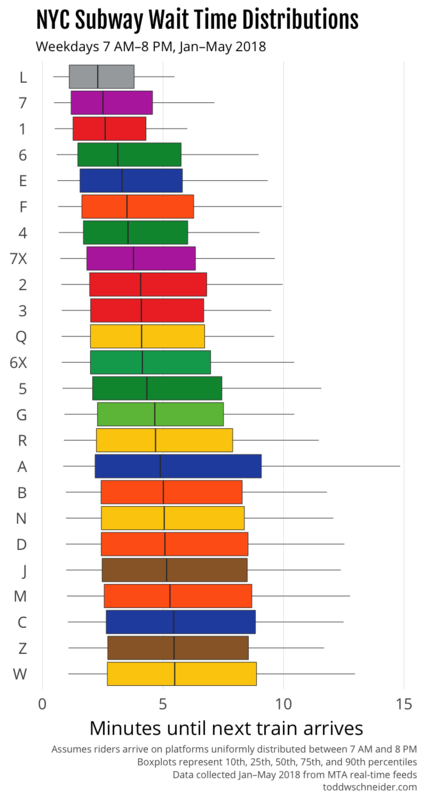 The chart below shows how long you should expect to wait for each train line, assuming you arrive on the platform at a random time on a weekday between 7:00 AM and 8:00 PM. The top four trains with the shortest waits—the L, 7, 1, and 6—are the only trains that run on dedicated tracks, which presumably helps avoid delays due to trains from other lines merging in and out on different schedules. The L train is also the only line that uses modern communications-based train control (CBTC), which allows trains to operate in a more automated fashion. The 7 train, the second most reliable according to my data, is currently running “partial” CBTC, and is slated for full CBTC in 2018. How long will you have to wait for your train? The above graph is restricted to weekdays between 7:00 AM and 8:00 PM, but wait times vary from hour to hour. In general, wait times are shortest during morning and evening rush hours, though keep in mind that the data doesn’t know about cases where trains might be too crowded to board, forcing you to wait for the next train. Choose your line below, and you can see how long you should expect to wait for a train by time of day, based on weekday performance from January to May 2018. How crowded should you want the platform to be when you arrive? Most New Yorkers intuitively understand that when they get to a subway platform, they don’t want it to be too empty or too crowded. An empty platform means that you probably just missed the last train, so it’s unlikely another one will be arriving very soon. Even worse, an extremely crowded platform means that something is probably wrong, and maybe the train will never arrive. There’s a Goldilocks zone in the middle: a healthy amount of crowding that suggests it’s been a few minutes since the last train, but not so long that things must be screwed up. 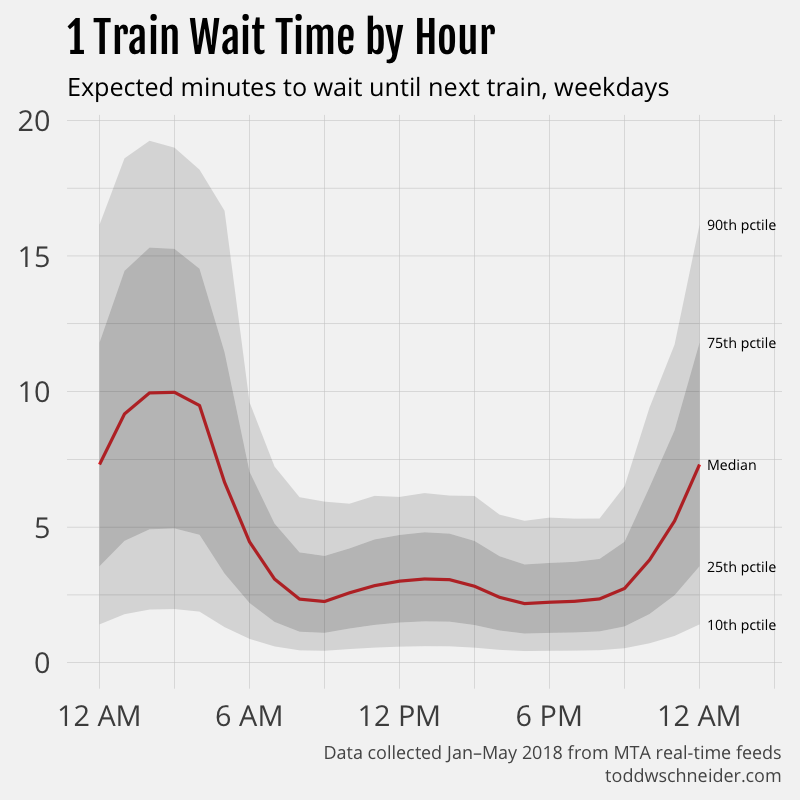 I used the same data to compute conditional wait time distributions: given that it’s been N minutes since the last train, how much longer should you expect to wait? 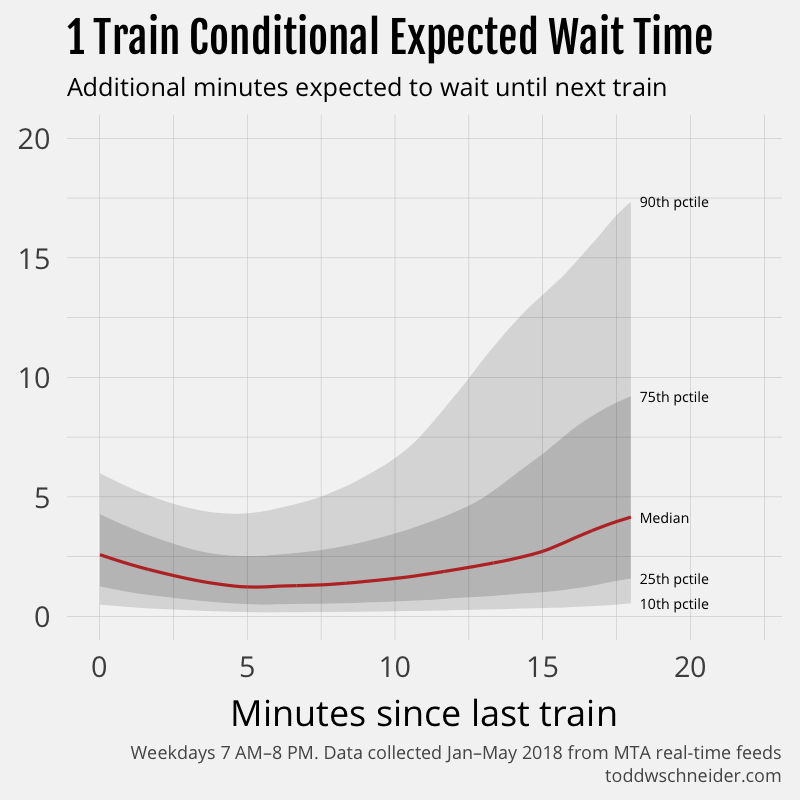 In most cases, the shortest conditional wait time occurs when it’s been 5 to 8 minutes since the last train. Choose your line to view conditional wait times. In general when you arrive on the platform, you can’t directly observe when the last train departed, but you can make a guess based on the number of people who are waiting. First you would have to estimate—or maybe even measure from the MTA’s public turnstile data—the number of people who arrive on the platform each minute. Then, if you know the shortest conditional wait occurs when it’s been 6 minutes since the last train, and you estimated that, say, 20 people arrive on the platform each minute, you should hope to see 120 people on the platform when you arrive. Of course these parameters vary by platform and time of day, so make sure to take that into account when making your own estimates! The recently released Fast Forward plan from Andy Byford, president of the NYC Transit Authority, proposes that it will take 10 years to implement CBTC across most of the system. The NYT further reports an estimated price tag of $19 billion. If every line were as efficient as the CBTC-equipped L, I estimate that the average wait time would be around 3 minutes shorter. At 5.7 million riders per weekday, that’s potentially 285,000 hours of time saved per weekday. Reasonable people might disagree about the economic value of deadweight subway waiting time, but $20 per hour doesn’t strike me as crazy, and would imply a savings of $5.7 million per weekday. Weekends have about half as many riders as weekdays, and time is probably worth less, so let’s value a weekend day’s savings at 25% of a weekday’s. Overall that would imply a total savings of over $1.6 billion per year, and that’s before accounting for the fact that CBTC-equipped trains also probably travel faster from station to station, so time savings would come from more than reduced platform wait times. And if people had more confidence in the system, they wouldn’t have to budget so much extra travel time as a safety buffer. Other potential benefits could come from lower operating and repair costs, and less above-ground traffic congestion if people switched from cars to the presumably more efficient subway. To be fair, there are all kinds of things that could push in the other direction too: maybe it’s unrealistic that other lines would be as efficient as the L, since the L has the benefit of being on its own dedicated track that it doesn’t share with any other crisscrossing lines, or maybe the better subway would be a victim of its own success, causing overcrowding and other capacity problems. And perhaps the most obvious criticism: that the plan will end up taking longer than 10 years and costing more than $19 billion. I don’t think this quick back-of-the-envelope calculation should be taken too seriously when there are so many variables to consider, but I do think it’s not hard to get to a few billion dollars a year in economic value, assuming some reasonable parameters. Reasonable people might again argue about discount rates and amortization schedules, but a total cost in the neighborhood of $19 billion over 10 years strikes me as eminently worth it. The NYT recently published a great interactive story that demonstrated via simulation how a single train delay can cause cascading problems behind it. The week after that story was published, I was (un)fortunate enough to participate in a real-life demonstration of the phenomenon. On May 16, 2018, I found myself on a downtown F train from Midtown. Around 10:00 AM at 34th Street, the conductor made an announcement that there was a stalled train in front of us at W 4th Street, and that we’d be delayed. The delay lasted about 30 minutes, and then the train carried on as normal. Here’s a graphical representation of downtown F trains that morning, with major delays highlighted in red. My train was the second train in the major delay on the right-center of the graph. Although I wasn’t on the train that had mechanical problems at W 4th Street, my train and the two trains behind it were forced to wait for the problem train. 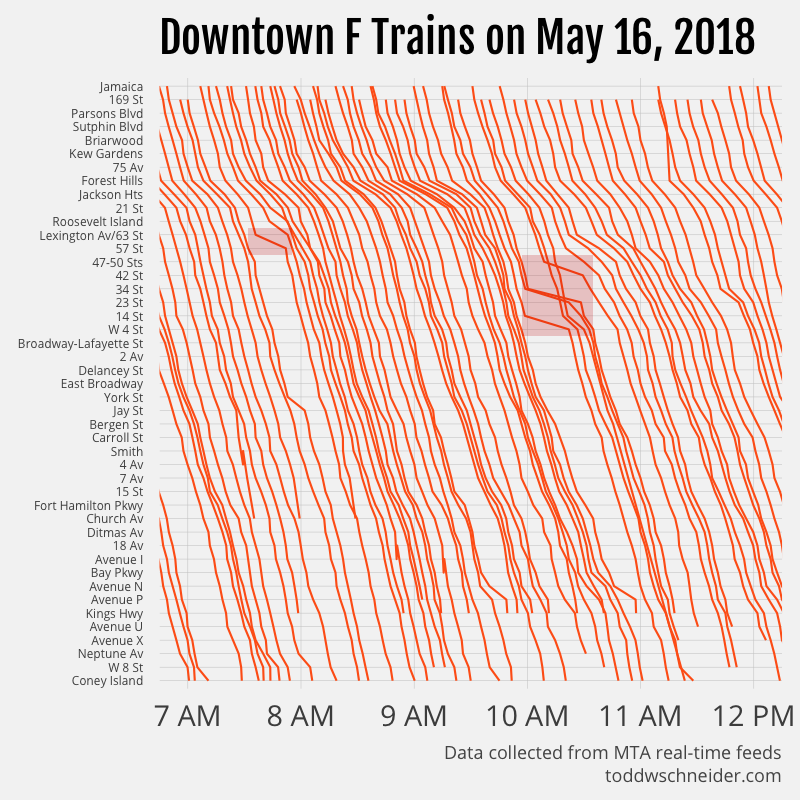 Further back, the train dispatcher switched a few F trains to the express tracks from 47-50 Sts–Rockefeller Center to W 4th Street, which is why you see a few steeper line segments in the graph that appear to cut through the delay. The empty diagonal gash in the graph below the delay shows that riders felt the effects all the way down the line. If you were waiting for an F train at 2nd Avenue just after 10:00 AM, you would have had to wait a full 30 minutes, compared to only a few minutes if you had arrived on the platform at 9:55 AM. I’m a bit surprised that the MTA didn’t deliberately slow down some of the trains in front of the delay. It’s well-known that even spacing is a key to minimizing system-wide wait time, the MTA once even made a video about it, but in this case it appears they didn’t practice what they preach. Slowing down a train in front of a delay will make some riders worse off, namely the ones at future stops who would have made the train had it not been slowed down. But it will also make some riders much better off: the ones who would have missed the train had it not been slowed down, and then had to suffer an abnormally long wait for the delayed train itself. You can use the graph to convince yourself that slowing down the train ahead of the delay would have been a good thing. Downtown F trains stopped at 2nd Avenue at 9:58 and 10:00 AM. If the 10:00 AM train had been intentionally delayed 10 minutes to 10:10 AM, all of the people who arrived on the platform between 10:00 and 10:10 would have been saved from waiting until 10:30, an average 20 minute savings per person. On the other hand, the folks who arrived between 9:58 and 10:00 would have been penalized an average of 10 minutes per person. But there were likely five times as many people in the 10:00–10:10 range than there were in the 9:58–10:00 range, so the weighted average tells us we just saved an average of 15 minutes per person. Compare the W 4th Street delay to the delay earlier that morning at 7:40 AM at 57th Street, highlighted on the left side of the graph. That delay, although shorter, also caused a lasting gap between trains. However, the gap was later mitigated when the train in front of the delayed train slowed down a bit between York and Jay streets. I suspect that slowdown was unintentional, but it was probably beneficial, and had it happened further up the line, say between 42nd and 34th streets, it would have produced more even spacing throughout the line, and likely lowered total rider wait time. In fairness to the MTA, in real life it’s not as simple as “always slow down the train in front of the delay” because there are other considerations—dispatchers don’t know how long the delay will last, not every platform is equally popular, and there other options like rerouting trains to other tracks—but a healthier system could have dealt with this delay better. The subway’s deteriorating performance has been covered at great length by many outlets. I’d recommend the NYT’s coverage in particular, but it seems like there are so many people writing about the subway recently that there’s no shortage of stories to choose from. In addition to the dataset I collected starting in January 2018, the MTA makes some real-time snapshots available going back to September 2014. 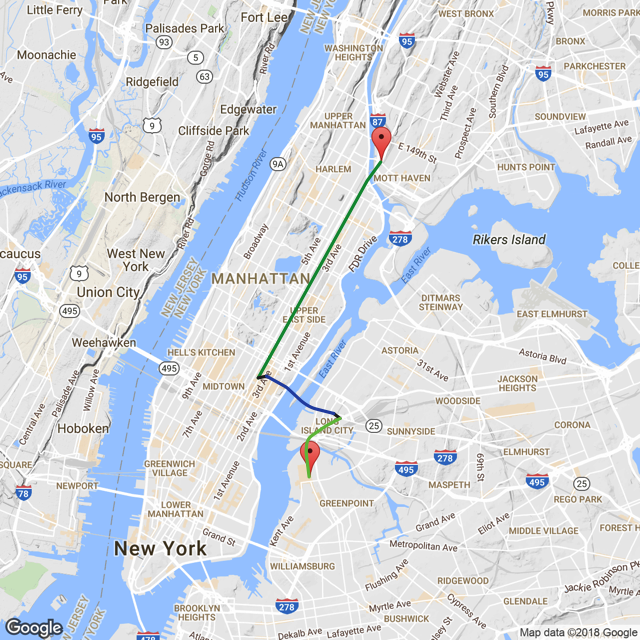 These snapshots are only available for the 1, 2, 3, 4, 5, 6, and L trains, and they’re in 5-minute increments as opposed to the 1-minute increments of my tracker. Additionally, there is a gap in historical coverage from November 2015 until January 2017. The historical data shows that expected wait times have remained fairly unchanged since 2014, but travel times from station to station have gotten a bit slower, at least on the 2, 3, 4, and 5 trains, where a weekday daytime trip in 2018 takes 3-5% longer on average than the same trip in 2014. The 1 and 6 trains have not experienced similar slowdowns, and the L is somewhere in the middle. 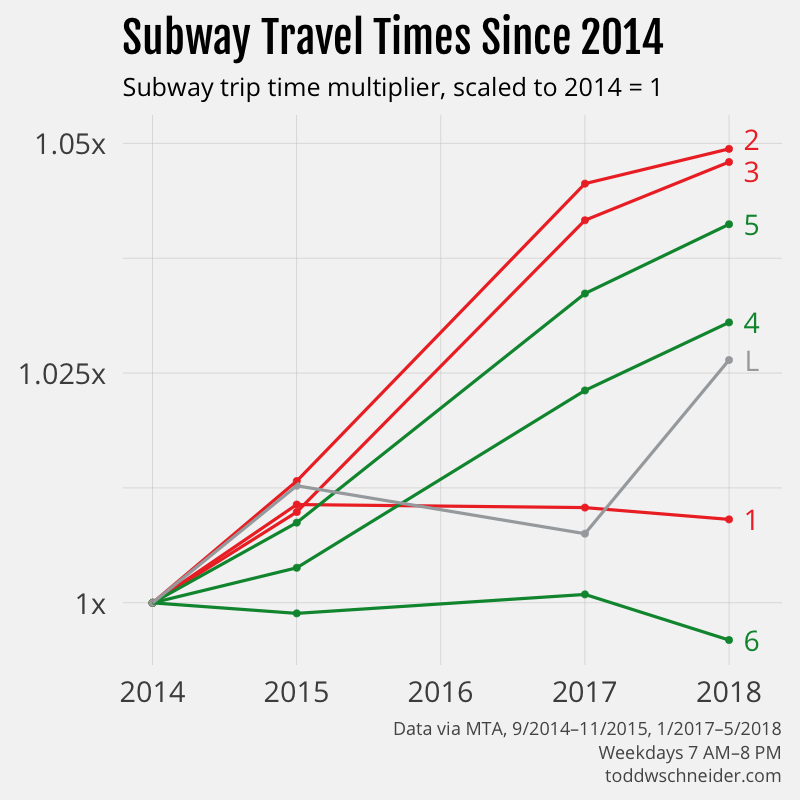 On a 15-minute trip, 3-5% is an average of 30-45 seconds slower, which doesn’t sound particularly catastrophic, but there are plenty of other issues not reflected in these numbers that might make the subway “better” or “worse” over time. I’ve tried to exclude scheduled maintenance windows from the expected wait time calculations, but in reality scheduled maintenance and station closures can be a huge nuisance. The MTA data also doesn’t tell us anything about when trains are so crowded that they can’t pick up new passengers, when air conditioning systems are broken, and other general quality-of-ride characteristics. I used the igraph package in R to construct a weighted directed graph of the subway system, where the nodes are the 472 subway stations, the edges are the various subway lines and transfers that connect them, and the weights are the expected travel times along each edge. For train edges, the weight is calculated as the median wait time on the platform plus the median travel time from station to station, and for transfer edges, the weight is taken from estimates provided by the MTA—typically 3 minutes if you have to change platforms, 0 if you don’t. With the graph in hand, we can answer a host of fun (and maybe informative) questions, as igraph does the heavy lifting to calculate shortest possible paths from station to station across the system. I used the directed graph to find the “center” of the subway system, defined as the station that has the closest farthest-away station. That honor goes to the Chambers Street–World Trade Center/Park Place station, from where you can expect to reach any other subway station in 75 minutes or less. 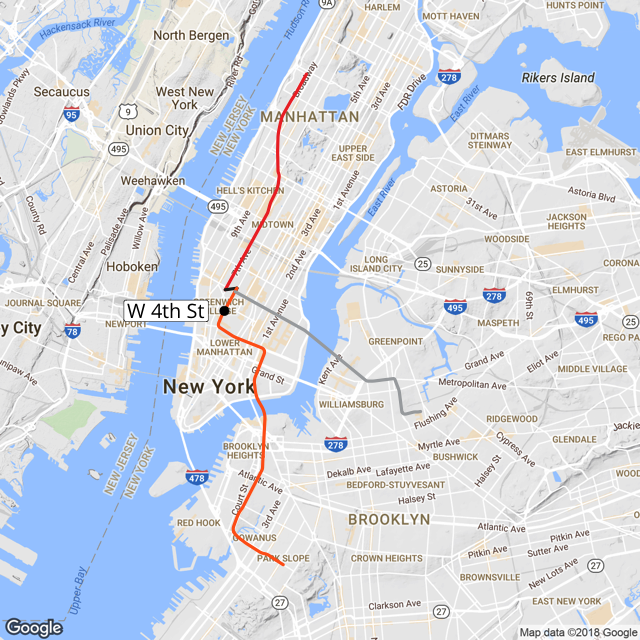 Here’s a map highlighting the Chambers Street station, plus the routes you could take to the farthest reaches of Manhattan, Brooklyn, Queens, and the Bronx. The directed graph might even be a good real estate planning tool. You might not care about the outer extremities of the city, but if you provide a list of neighborhoods you do frequent, the graph can tell you the most central station where you can minimize your worst-case travel times. For example, if your personal version of NYC stretches from the Upper West Side to the north, Park Slope to the south, and Bushwick to the east, then the graph suggests W 4th Street in Greenwich Village as your subway center: you can get to all of your neighborhoods in a maximum of 26 minutes. The graph can be used to calculate all sorts of other fun routes. I’ve seen attempts to find the longest possible subway trip that doesn’t involve any backtracking, which is all well and good, but what about finding the longest trip from A to B with the constraint that it’s also the fastest subway-only trip from A to B? 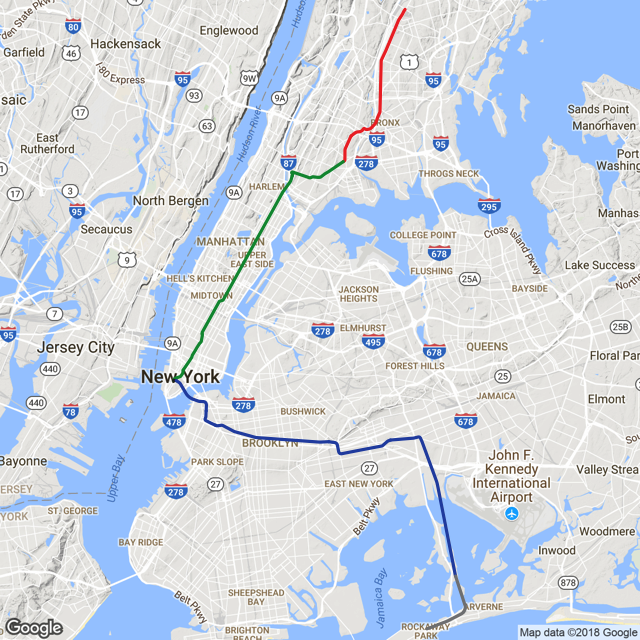 Based on my calculations, the longest possible such trip stretches from Wakefield–241st Street in the Bronx to Far Rockaway–Beach 116th Street in Queens via the 2, 5, A, and Rockaway Park Shuttle. It would take a median time of 2:28—about as long as it takes the Acela to travel from Penn Station to Baltimore. The directed graph is a bit silly: in many cases it wouldn’t make sense to rely only on the subway when other transportation options would be more sensible. I’ve written previously about taxi vs. Citi Bike travel times, and a logical extension would be to expand the edges of the directed graph to take into account more transportation options. Of course, a more practical idea might be to use Google Maps travel time estimates, which already do some of the work combining subways, bikes, ferries, buses, cars, and walking. Still, there’s something nice about estimating travel times based on historical trips that actually happened, as opposed to using posted schedules. There’s probably something interesting to learn by combining the MTA’s public turnstile data with the train location data. For example, the turnstiles might provide insights into when dispatchers should be more aggressive about maintaining even train spacing following delays. As the tracker collects more data, it might be interesting to see how weather affects subway performance, perhaps segmenting by routes that are above or below ground. All eyes will be on the subway system in the months and years to come, as people wait to see how the current “fix the subway” drama unfolds. Hopefully the MTA’s real-time data can serve as a resource to measure progress along the way. Although there’s no official record of when trains actually stopped at each station, the MTA provides a public API of the real-time data that powers the countdown clocks, which can be used to estimate train performance. Starting in January 2018, I’ve been collecting the countdown clock information every minute for every line in the NYC subway system, then calculating my best guesses as to when each train stopped at each station. Between January and May 2018, I observed some 900,000 trains that collectively made 24 million stops. The MTA’s data is very messy, and occasionally makes no sense at all, so I spent a considerable amount of time trying to clean up the data as best possible. For more technical details, including all of the code used in this post to collect and analyze the data, head over to GitHub. The countdown clock system uses bluetooth receivers installed on trains and in stations: when a train passes through a station, it notifies the system of its most recent stop. The MTA has acknowledged the system’s less than perfect accuracy, but it’s much better than the status quo from only a few years ago when we really had no idea where the trains were. Putting aside messy data issues, the MTA’s real-time feeds tell us the amount of time between trains. But riders probably care more about how long they should expect to wait when they arrive at the platform, and those two quantities can be different. 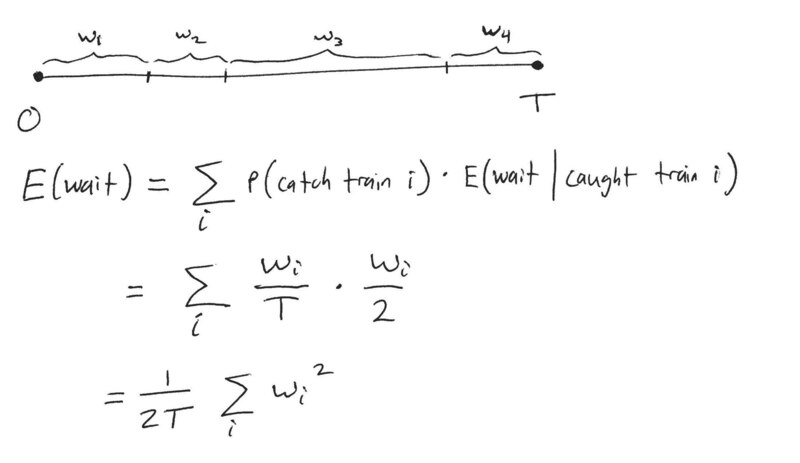 As a hypothetical example, imagine a system where trains arrive exactly every 10 minutes on the 0s: 12:00, 12:10, etc. In that world, riders who arrive on the platform at 12:01 will wait 9 minutes for the next train, riders who arrive at 12:02 will wait 8 minutes, and so on down to riders who arrive at 12:09 who will wait 1 minute. If we assume a continuous uniform distribution of arrival times for people on the platform, the average person’s wait time will be one half of the time between trains, 5 minutes in this example. Now imagine trains arrive alternating 5 and 15 minutes apart, e.g. 12:00, 12:05, 12:20, 12:25, etc., while people still arrive following a uniform distribution. The people who happen to arrive during one of the 5-minute gaps will average a 2.5 minute wait, while the people who arrive during one of the 15-minute gaps will average a 7.5 minute wait. The catch is that only 25% of all people will arrive during a 5-minute window while the other 75% will arrive during a 15-minute window, which means the global average wait time is now (2.5 * 0.25) + (7.5 * 0.75) = 6.25 minutes. That’s 1.25 minutes worse than the first scenario where trains were evenly spaced, even though in both scenarios the average time between trains is 10 minutes. If you work out the math for the general case, you should find that average wait time is proportional to the sum of the squares of each individual gap between trains. This means that given an average gap time, expected wait time will be minimized when the gaps are all identical. In practice, it very well could be worth increasing average gap time if it means you can minimize gap time variance. Looking back to our toy example, not only is the average of 52 and 152 greater than 102, it’s greater than 112, which means that trains spaced evenly every 11 minutes will produce less average wait time than trains alternating every 5 and 15 minutes, even though the latter scenario would have a shorter average gap between trains. For another take on this, I’d recommend Erik Bernhardsson’s NYC subway math post from 2016. Often we want more than the expected wait time, we want the distribution of wait times, so that we can calculate percentile outcomes. Normally this is where I’d say something like “just write a Monte Carlo simulation”, but I think in this particular case it’s actually easier and more useful to do the empirical calculation. Once you’ve done that, you’re pretty much done, as your box is now full of balls with numbers on them, and the probability of a rider having to wait some specific number of seconds t is equal to the number of balls labeled t divided by the total number of balls in the box. Note that you might want to filter trains by day of week or time of day, both because train schedules vary, and people don’t actually arrive on platforms uniformly, but if you restrict to within narrow enough time intervals, it’s probably close enough. In terms of the actual NYC subway lines during weekdays between 7:00 AM and 8:00 PM, the 7 train has the shortest median time between trains, but the L does a better job at minimizing the occasional long gaps between trains, which is why we saw earlier that the L has shorter average wait times than the 7. 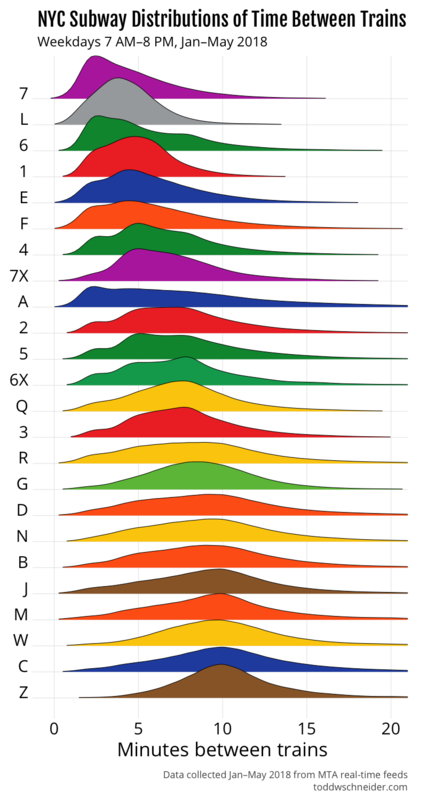 The A train has a notably flat and wide distribution, which explains why the first graph in this post showed that the A had the worst 75th and 90th percentile outcomes, even though its median performance is middle-of-the-pack. I wrote an open-source app called NBA Shots DB that uses the NBA Stats API to populate a database with all 4.5 million shots attempted in NBA games since 1996. The app also processes a dataset provided by Sportradar of over 1 million NCAA men’s shot attempts since 2013 into a format that can be merged with the NBA data. Both datasets include similar information: location coordinates, player and team names, which shots went in, and so on. 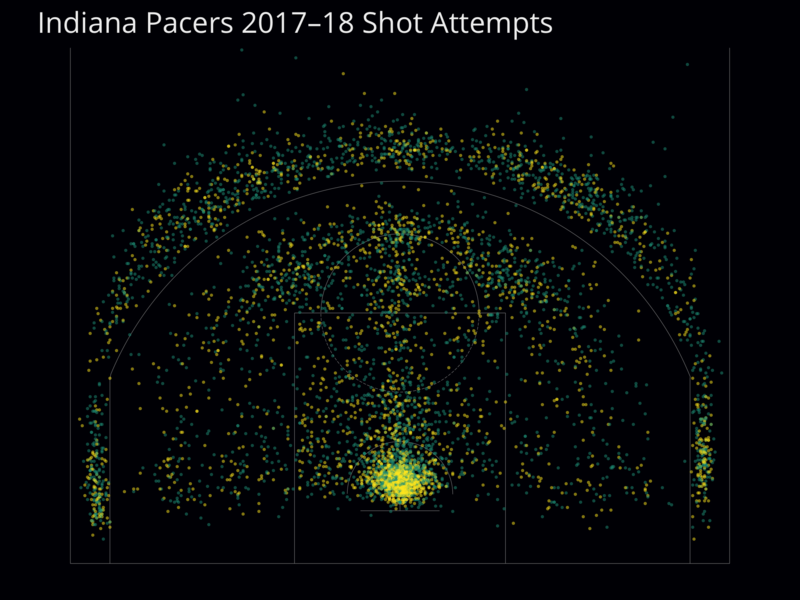 The merged dataset allows us to compare NBA and NCAA shot patterns on the same scale, and even allows tracking individual players as they move from college to the pros. Shot data has some significant limitations, and we should be very wary of drawing unjustified conclusions from it, but it can also help illuminate trends that might not be otherwise obvious to the human eye. The NBA’s aggregate field goal percentage is slightly better than the NCAA’s, 46% to 44%. 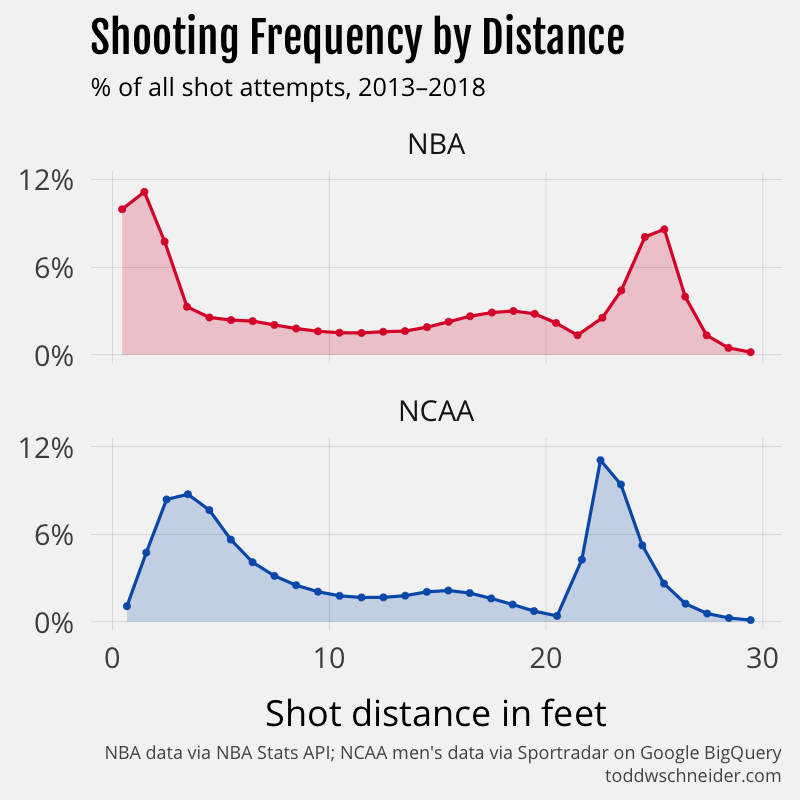 I would have guessed that NBA professionals would be better shooters than NCAA players at all distances, but it turns out that for shots under 6 feet, NCAA attempts are more likely to go in. The shot data can’t tell us why—my guess is that the NCAA has more mismatches where an offensive player is much bigger than his defender, leading to easier interior shots, but we don’t really know. An important disclaimer: neither dataset is particularly clear about where its data comes from. The NBA data is presumably generated by the SportVU camera systems installed at NBA arenas, but I don’t know how Sportradar produces the NCAA data. It could come from cameras, manual review of game tape, or something else. If the systems that gather the data are different enough, it might make comparisons less meaningful. For example, it seems a bit odd that the NBA data reports a much higher frequency of shots less than 1 foot from the basket. 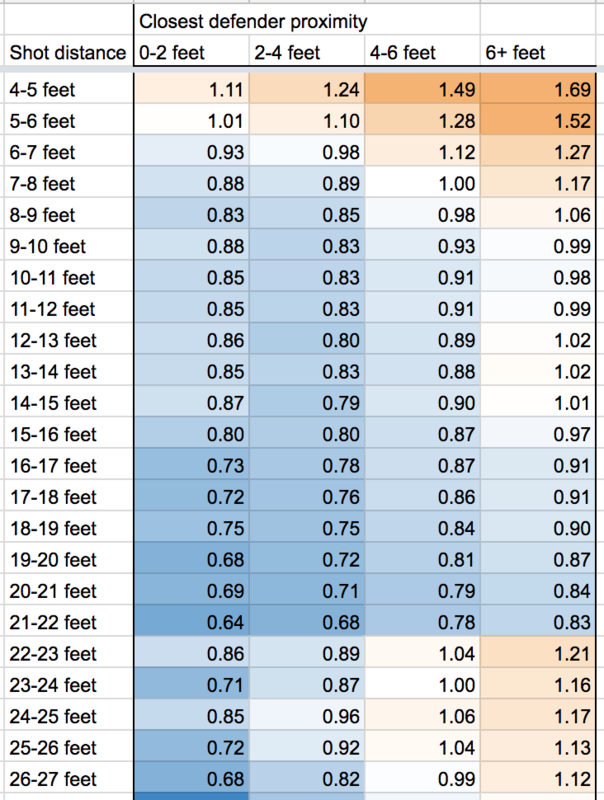 It makes me think the measurement systems might be different, and maybe what’s recorded as a “1 foot” shot in the NBA is recorded as a “3 foot” shot in the NCAA. 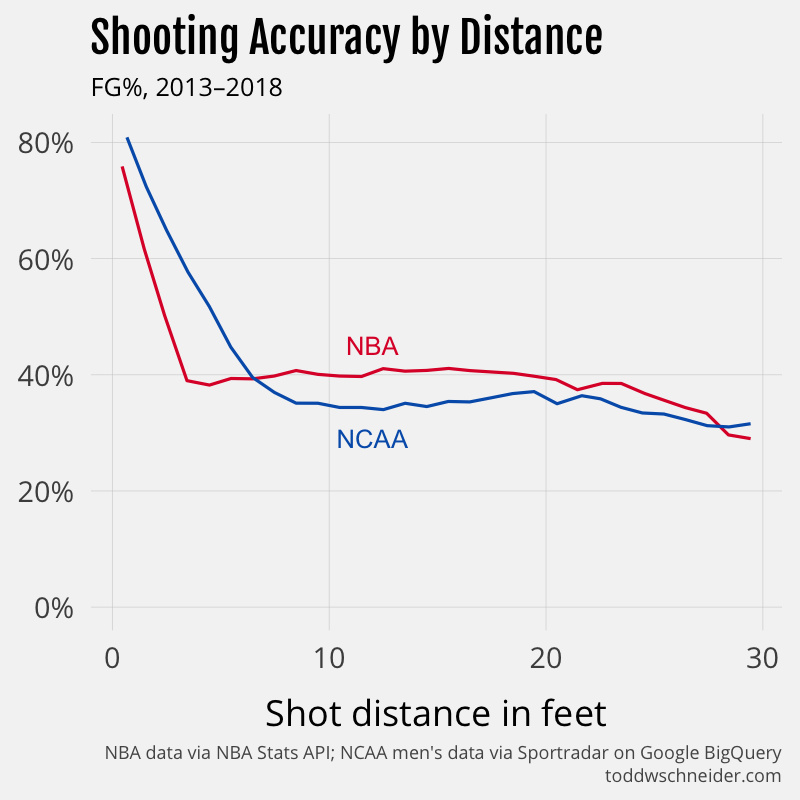 If we restrict to all shots under 6 feet in each dataset, the NCAA still has a slightly higher FG% than the NBA (59% vs. 58%), but depending on how the recording systems work, the accuracy gap at short distances might be significantly smaller than the graph would have you believe. The college 3-point line is 3 feet closer to the basket than the NBA line in most places, though the gap narrows to 1.25 feet in the corners. 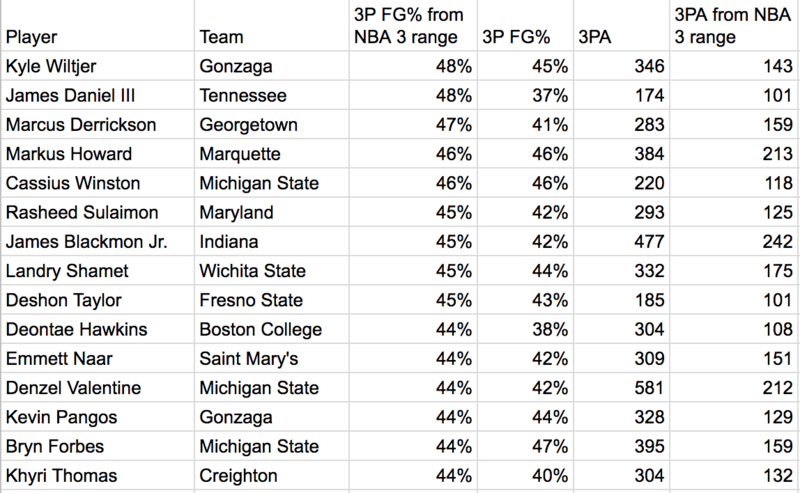 But of course there’s nothing to stop a college player from shooting from NBA 3-point range, and NBA scouts might be particularly interested in how college players shoot from NBA-range as a predictor of future pro performance. Unfortunately for any aspiring scouts, it looks like this might not be a good predictor of future NBA performance. Based on the 23 players in the dataset who attempted at least 100 NBA-range 3-pointers in college and another 100 3-pointers in the NBA, there’s no strong correlation between college and pro results. Most of the players had lower accuracy in the NBA than in college, though Terry Rozier of Louisville and the Boston Celtics managed to improve his NBA-range 3-point shooting by +9%. There are many competing factors that might influence field goal accuracy when a player transitions from college to the pros. Players presumably get better with age in their early 20s as they mature physically, NBA players probably practice more, and have access to better training facilities and coaching, all of which suggest they might shoot better in their first professional season than they did in college. On the other hand, NBA rookies have to play against other NBA players, who are on average much better defenders than their previous college opponents. We’ve seen anecdotally with 3-point attempts that an individual player usually shoots worse in the NBA than he did in college, but I wanted to do something at least a bit more scientific to quantify the effect. Using a dataset of 129,000 shots from 262 players who appear in both datasets, I ran a logistic regression to estimate the change in field goal accuracy associated with the transition from college to the NBA. It’s a crude model, considering shot distance, whether the player is in his final year of college or his first year in the NBA, and a player-level adjustment for each player. The model ignores any differences between positions, so if guards and centers are affected differently, the model would probably miss it. 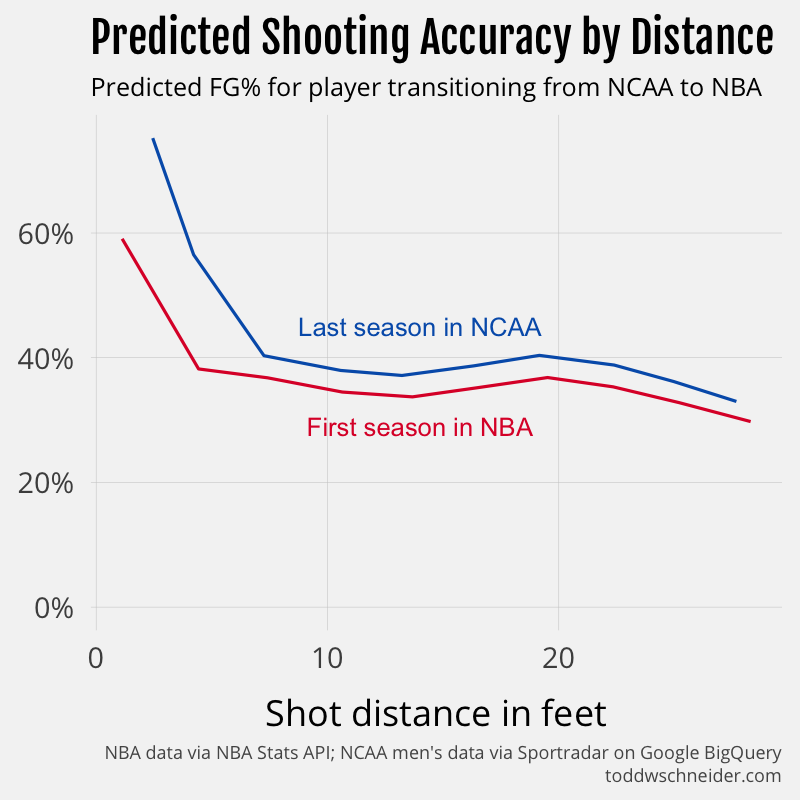 The simple model predicts that, on average, as a player goes from his last year in college to his first year in the NBA, his field goal percentage will decline by around 4% on shots over 6 feet, and as much as 15% on shorter shots. It doesn’t say anything about why, though again I’d suspect the primary explanation is that NBA players are much better defenders. At first glance, this result that players shoot worse when they go from college to the NBA might seem in conflict with the first chart in this post, which showed that NBA players had higher field goal percentages on longer shots than college players. The most likely explanation is that rookies are below-average shooters among all NBA players, and as rookies turn into veterans, their shooting performance improves. Note that the merged NBA/NCAA dataset has a data truncation issue: because the NCAA data only spans 2013–18, any player who was in both leagues during that period has at most 4 years of NBA experience. Over time, assuming both datasets remain publicly available, it will be interesting to see if there is an NBA experience level where a player’s shooting performance is expected to exceed his college stats. 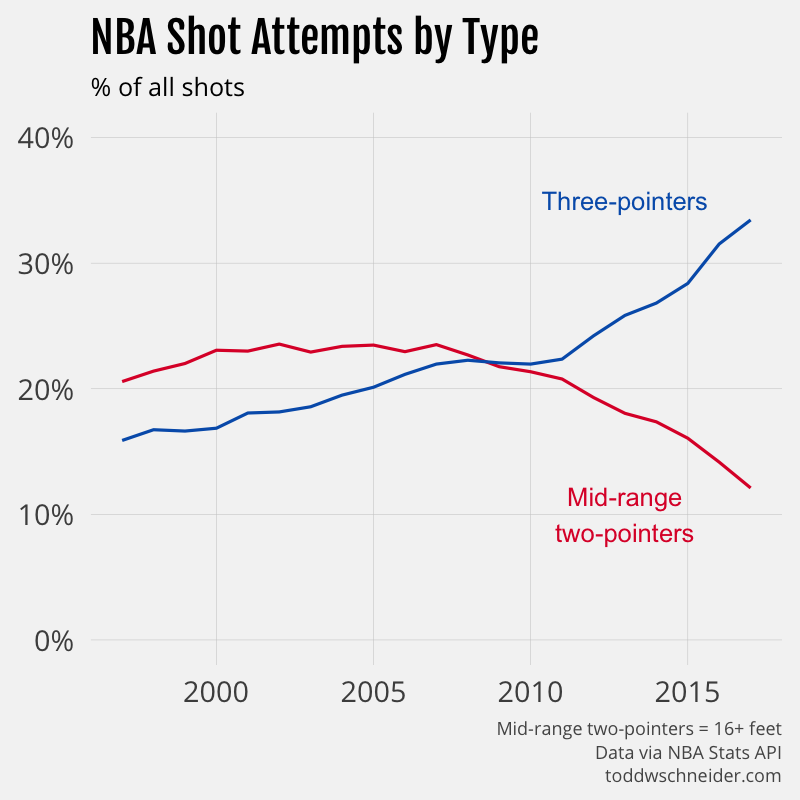 Even the most casual basketball fan probably knows by now that 3-point attempts have exploded in popularity, while mid-range 2-point attempts are in decline. It’s gotten to the point where there are some signs of blowback, but overall the trend continues. 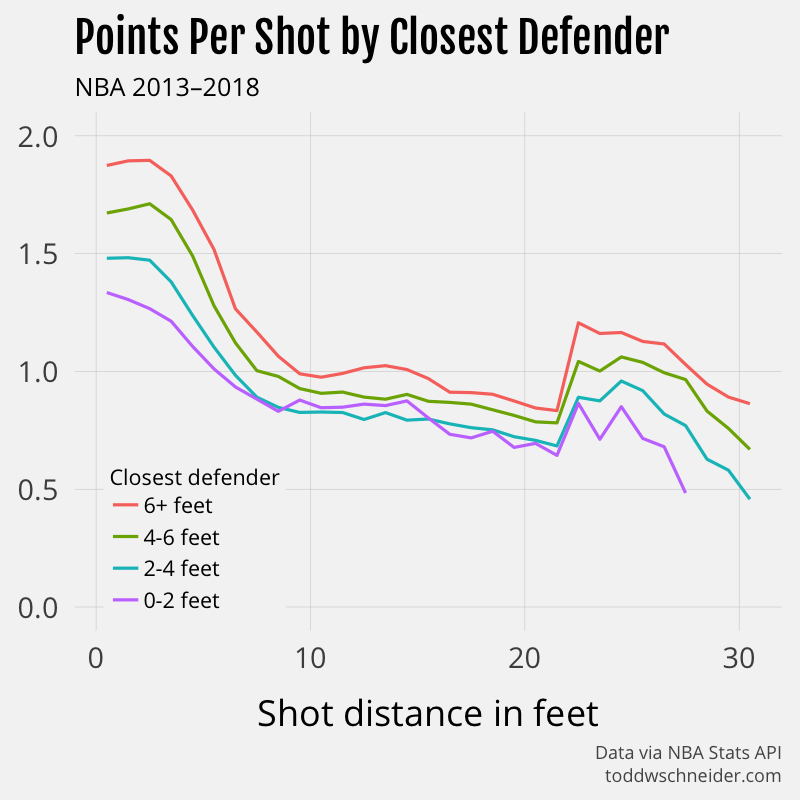 The NBA Stats API provides some aggregate data on shooting performance based on both the distance of the shot, and the distance of the closest defender at the time of the shot, which shows that yes, usually a 3-point attempt has a higher expected value than a long-range 2. But if the 3-pointer is tightly guarded and the long-range 2 is wide-open, then the 2-pointer can be better. For example, a wide-open 2-point shot from 20 feet on average results in 0.84 points, while a tightly-guarded 3-point attempt from 25 feet only averages 0.71 points. Again, basketball is complicated and these isolated data points are not a final authority on what constitutes a good or bad shot. In the 2017-18 season, the Houston Rockets and Indiana Pacers have both been successful even though they are at opposite ends of the shooting spectrum, with the Rockets shooting the most 3s, and the Pacers shooting the most long-distance 2s. To be fair, the 3-point-happy Rockets currently have the best record in the league, but the Pacers’ success, despite taking the most supposedly “bad” mid-range 2s of any team in the league, suggests that there’s more than one way to win a basketball game. Another important note: for unknown reasons, the aggregate stats by distance and closest defender do not match the aggregates computed from the individual shot-level data. The shot-level data includes more attempts, which makes me think that the aggregates by closest defender are somehow incomplete, but I wasn’t able to find more information about why. The difference is particularly pronounced in shots of around 4 feet, with the shot-level data reporting a significantly lower FG% than the aggregate data. 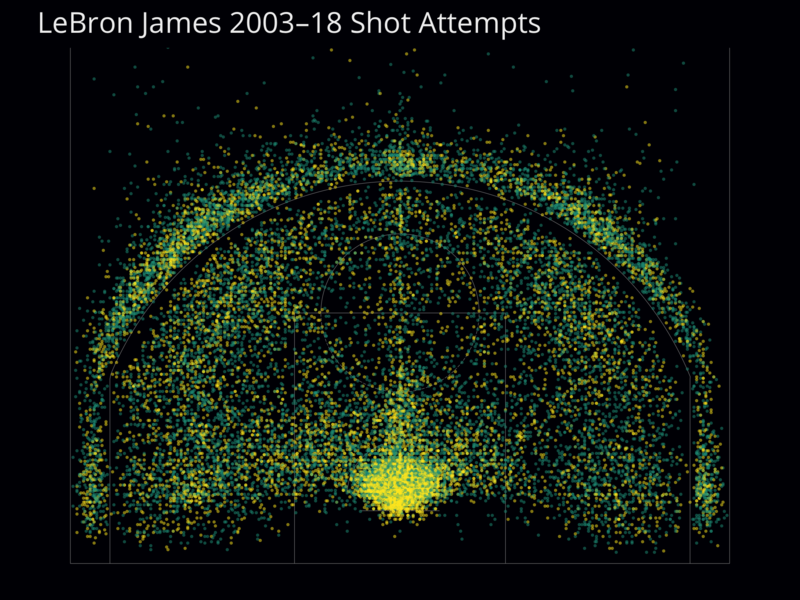 The code used to compile and analyze all of the NBA and NCAA shots is available here on GitHub. The NBA Stats API has many more (mostly undocumented) endpoints, and the code could probably be expanded to capture more information that could feed into more detailed analysis. Every so often I see a story about whether or not the hot-hand exists, and though I kind of doubt that debate will ever be settled conclusively, maybe the shot-collecting code can be of use to future researchers. 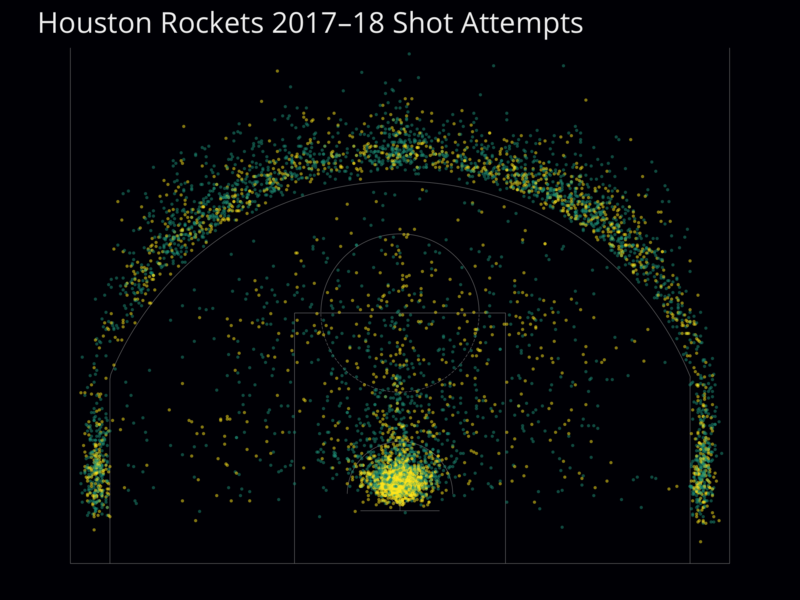 These images use an adapted version of my BallR shot chart app, but a better solution would be to expose an API from the NBA Shots DB app, then have BallR connect to that API instead of hitting the NBA Stats API directly.